Originally my friend Lena and I had planned to spend New Year’s Eve in Tulum, Mexico. But due to organizational issues it wasn’t possible for us to book accommodation weeks in advance which at that time of the year is absolutely necessary. So we figured that the next best option over NYE would be Merida. What we didn’t take into account was that Mexicans mostly celebrate the beginning of the New Year at home with family members. So no big NYE parties as we know it – despite the fact that Merida is the biggest city on the Yucatan peninsula. So we ended up going for a few drinks at the only bar that had something like a NYE party and that was it. Whilst in Merida we thought it would be a good idea to visit the cenote IK-Kil (Find the Wikipedia explanation of what a cenote is here!) as well as the Maya ruins in Chichen-Itza. What a massive disappointment. Chichen-Itza was overrun by tourists and felt more like a cheap souvenir market than the city of a former high culture, especially after having visited Copán, Palenque and Tikal. If you have the chance to visit any of these sites, do yourself a favor and skip Chichen-Itza. The same pretty much applies for the cenote Ik-Kil. If you look at pictures on the internet it looks absolutely stunning. In reality the cenote is inside a hotel complex, partially artificial and completely overrun by tourists from all kinds of countries. There are plenty of fantastic cenotes in the area. Again, do yourself a favor and choose any of the not so commercialized cenotes. Since spending NYE in Tulum didn’t work out, we decided to go there right after Merida since we really wanted to check out the Maya ruins right at the sea as well as the cenotes. Lena and I were really interested in going diving in one of the cenotes in the area. Probably one of the most popular ones is the system Dos Ojos which consists of an underwater cave and cavern system that spreads an amazing 82,4 km underneath the ground with 28 cenotes in total. We chose to go with the diving school Scuba Tulum (www.scubatulum.mx; marina@scubatulum.mx) simply because the prices were pretty much the same everywhere and the owner Marina was exceptionally helpful and friendly. The two dives, the transportation, the admission to the cenotes as well as a small lunch cost us a total of MXN 1800 / 105,88€. There is a variety of cenotes to choose from in which you can go and dive. It is hard to say which one is the best since that all depends on the weather, the rainfall prior to the dives as well as the personal experience of the diver. But it generally helps if you’re a more experienced diver since some of them are quite deep and/or tight. 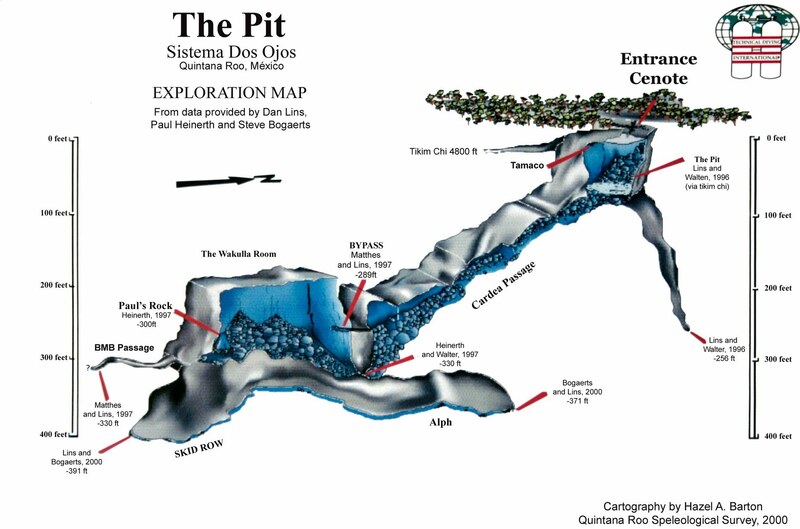 For the first dive we chose “The Pit”, a rather deep cavern that drops down to 118 meters. Of course you’ll only dive to about 40m but that is nevertheless stunning. After a few meters we hit a halocline – a layer in which fresh water from the top and salt water from the bottom mix. Whilst continuing our descent we were able to see the sulfur layer at about 32m with dead trees sticking out – one of the most impressive things I have ever seen diving since you feel like you’re diving into the set of a horror movie as you start descending into the dense sulfur fog. The rest of the cavern is filled with breathtaking rock formations, stalactites as well as stalagmites and deep tunnels that seem to lead into the abyss. Hands down, this was probably the best dive I have done in my life and worth every dollar! The second dive was in the cenote “Pet Cemetery” which got its name from animal bones that you will encounter along the dive. During the dive we followed a line that lead through the cavern system so you wouldn’t get lost – and if that line wasn’t there, that’s exactly what would happen. The cavern is a maze filled with crystal clear water. Diving in the cenotes simply blew my mind, definitely my personal Mexico highlight! The second reason for us to go to Tulum – visiting the Maya ruins by the sea – didn’t quite work out since it was too busy. The number of people lining up at the entrance was just ridiculous which is why we decided to skip them and spend an amazing day at the beach instead, especially after our Chichen-Itza experience. Tulum has some amazing things to offer so if you’re going on a holiday in Yucatan, make sure you stop by and go diving in the cenotes.